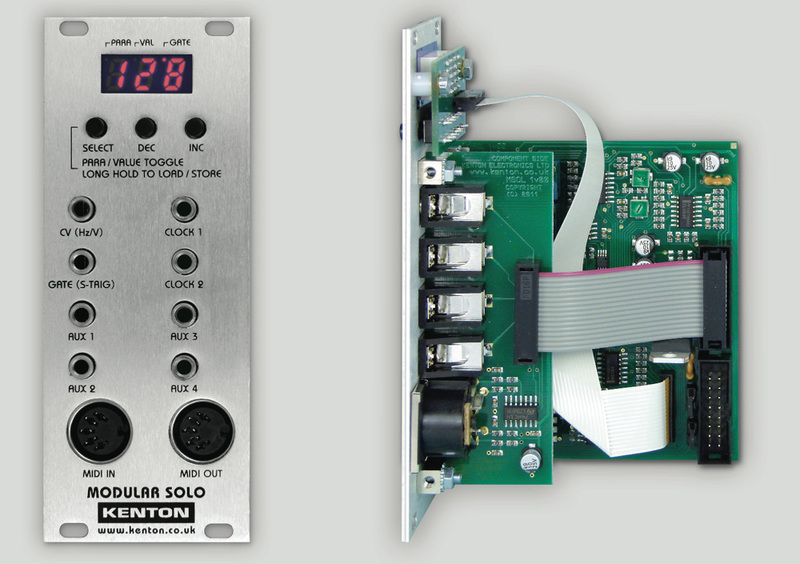 Modular Solo, Audio/MIDI Converter from Kenton. Kenton Electronics announces the availability of Modular Solo, a MIDI-to-CV convertor, designed specifically for use in the ‘small’ Eurorack (A100) modular synth system format. The 3U-/128mm-high, 10HP-/50mm-wide Modular Solo ships with a ribbon cable ready to fit into a Eurorack (A100) modular system — you plug one end into the free slot on the Modular Solo itself and the other into the backplane of the modular case to supply the required power (+12V supply 85mA max/-12V supply 3mA). Control Voltage (CV) and Gate signals can be sent via the ribbon cable to the system bus (selected using jumpers). Moreover, Modular Solo incorporates a built-in LFO (with variable rate/speed and waveshapes, including Triangle, Sawtooth up, Sawtooth down, PulseWidth 10%, PulseWidth 20%, PulseWidth 30%, PulseWidth 40%, Square, and Sample & Hold), plus portamento, and other functions. 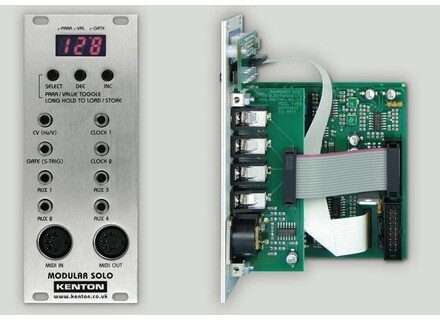 Modular Solo is available to order directly from Kenton Electronics (kentonuk.com/modularsolo) for £195.00 GBP (including VAT), or through one of their dealers. Revel Breezer Breezer is a audio and sample library manager which helps you to find and preview your audio files. G-Sonique Mid-Side: Creative Stereo-Phase filter+ G-Sonique has released Mid-Side: Creative Stereo-Phase filter+, a VST effect unit for Windows that offers new ways of stereophonic sound modulation.